Use GeoGebra Augmented Reality to place your constructions in your sourroundings and discover them from different perspectives. So you can discover math in the real world by taking screenshots from different perspectives. You can switch to the Augmented Reality Mode by tapping on the AR Button in right corner of the 3D Graphics View. After tapping on this button you have to move around slowly to detect a surface. Have a look at the hint on your phone because it tells you when the app has detected a surface. When a surface is detected a square displays which marks the detected surface. If you want to put your object there, just tab on the screen to place the object. Now you will see your construction in your surrounding. You can scale, translate and rotate your model by using your fingers. 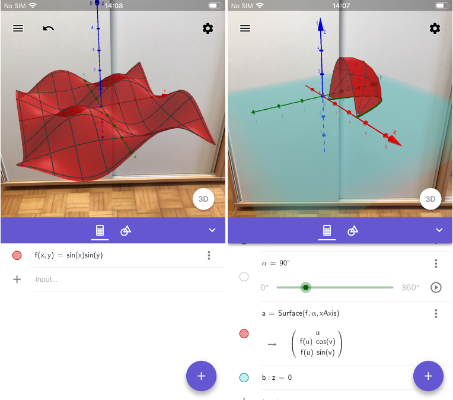 The GeoGebra 3D Calculator includes several examples of 3D math objects which you can place on your table, floor or any flat surface around you. To explore this examples open the Menu and select Search. There you can find a lot of exciting math examples and explore them in the real world. While you are in the AR Mode you can use the Algebra Tab e.g. to create functions or to use sliders. Just tab on the Algebra Tab icon and enter a function in the Input Bar. The function appears immediately in the AR view. You also can use the coloured marbles in the Algebra Tab to show and hide objects. Use the three dot menu to duplicate or delete an object. There you also can open the Settings to change the colour, the opacity or the style. If you want to create your own objects by using the tools from the Tools Tab, you have to switch to the 3D Graphics View by selecting the 3D button and create your objects there. After you have created an object, you can switch to the AR Mode and see your object in your surrounding. Check if your phone or tablet is compatible with Augmented Reality. For Android phones you could have a look at this list, to check, if your device is compatible. For iOS iPhone 6s or later, iPad 5 or later and the iPad Pro are compatible. An other easy way to find out if your device is compatible: If AR is supported you will get the AR button on the bottom right, otherwise not. 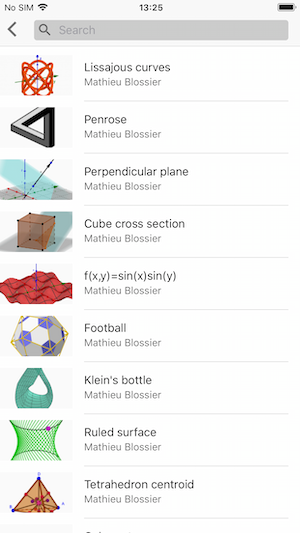 For more inspiration check out our friend Tim's channel Brzezinski Math or have a look at his GeoGebra Book Augmented Reality: Ideas for Students﻿.